Inspired by this northern Japanese city of snowscapes and elegant cuisine, Sapporo Sesame Flavored Seasoning Oil captures just that very essence. For a stronger taste profile, choose Heavenly Chef Japanese Style Sesame Oil. 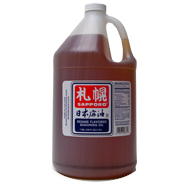 Sapporo Sesame Flavored Oil is available in 8 fl oz, 16 fl oz and 1 gallon sizes.